This short guide gives tips on sailing ships. Sailing is fairly simple and tremendous fun. 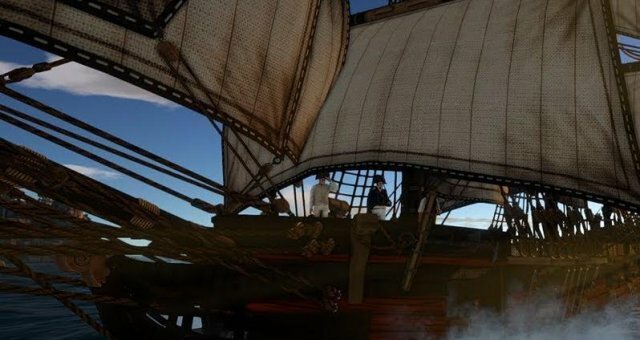 If you have played naval battles in Empire Total War or Sid Meier's Pirates!, then you will get the hang of sailing in Holdfast real fast. It's very similar. First, you have to man the ship's wheel. Any class can man it, but the captain can take it back at any time. 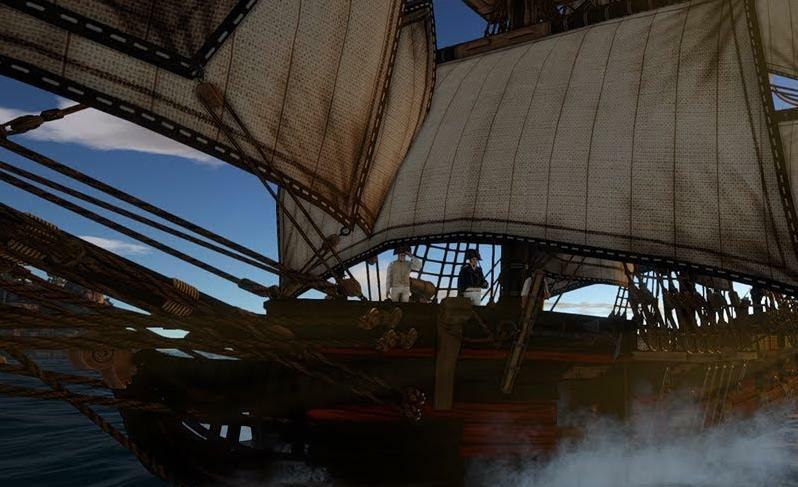 Once you take the wheel, you view the ship from high in third person. You can also switch to first person with CTRL if you want to look around on the ship. There are several sails so each key press raises or lowers one set of sails at a time. The number keys raise individual sets of sails without having to cycle. 1 to 1-6 depending on the size of the ship. Your sails need to be lowered to move forward. Raising sails slows you down. In general, more sails lowered makes you go faster. Less, slower. In the lower left of the screen is a compass with a dotted line down the middle with an arrow showing the wind direction. If you sail with the wind, you go fast; if you sail against the wind, you go slow. If you sail dead on against the wind, you will stop. The trick to sailing against the wind is to not to go at it head on but slightly to the left or right of the wind-line in the compass, about 10-20 degrees. There are two types of sails. Square rig and lateen (triangular and trapezoidal). when you're perpendicular to the wind. Press the number keys to raise them. On the biggest ships it's 3 and 5. Lateen sails are good all-around. They are designed for sailing with or against the wind. Raising and lowering lateen sails can help make tighter turns. For example, look at how the sails are bulged. If all the sails are bulging right, and you make a right turn, then your rear sails will be fighting against the turn because they are catching wind as the tail of the ship moves left, so raising them will help make the ship turn faster; in the same situation, but making a left turn, the opposite is true. The front sails need to be raised. On smaller ships, if you turn right or left, you will see an immediate response. On the biggest ships, you can be pressing the D key forever before it starts to turn right. So you have to be patient. Written by Admiral Cheesemonger of Arrakis.